The federal election campaign is now officially under way, which means we’ve been plunged headlong into the black hole of empty slogans, tired clichés, insidious euphemisms, half truths, and complete lies. But, hey, at least we’re all in it together. There’s nothing like an impending election to lower the tone of political language and to muddy the waters of clear and informative discourse (except maybe the Murdoch press, zing!). This column is dedicated to the twists and turns of phrase uttered by politicians on the campaign trail, as viewed through the thick lenses of Toby Newton’s specks. Boat people, asylum seekers, illegal immigrants, illegal arrivals, refugees. So many different descriptors for the same THREAT TO OUR NATIONAL SECURITY. What’s a politician to do? For those interested in the skilled arts of obfuscation, dog-whistling, and language-wrangling, this issue is a gold mine. The approaches taken by both major parties over the last 15 years have been simultaneously varied in their method and ruthlessly singular in their goal: to reduce to the smallest number possible the arrival of asylum seekers travelling by boat to Australia. To my mind, the exploitation of this ‘problem’ stems more or less from a degenerate appeal to an assumed latent xenophobia within the voting public. Of course, as a politician in modern Australia it would be unwise to admit this freely. Thus euphemisms. Over the last decade in particular a very specific language has developed around asylum seekers that not only serves the political interests of the major parties, but has also resulted in a gradual shift in the political agenda towards the extreme. Although the coalition initially took the lead in this respect under John Howard, Labor has made clear that it won’t be outdone. An argument based on process, legality, and order, dovetails beautifully with the national security argument because once again it reinforces a dichotomy between law-abiding Australians and nasty, desperate, cheating foreigners who’ll do anything to get into this country. Their inherent criminality is hammered home by descriptors such as ‘illegals’, ‘illegal immigrants’, or ‘illegal arrivals’, a phrase Tony Abbott continues to employ regularly. One of the key results of this relentless attack on refugees was that it reduced the issue to one of national and border security rather than one of humanitarian responsibility. Instead of working to shift the discussion, Labor chose to fight the coalition on its own turf, accepting and parroting many of the same arguments and utilising much of the same language. Around the time of his first election, Kevin Rudd showed he was capable of innovation, however, by shifting the focus away from asylum seekers and onto people smugglers. This shift was an extremely clever rhetorical move that allowed the Labor Party, and subsequently the Coalition, to appeal to the middle ground of voters that were put off by the inherent cruelty of using vulnerable refugees as political punching bags. 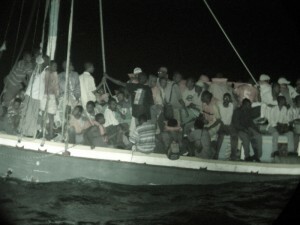 Of course, both parties’ policies continued to become even more hard-line thanks to the new disguise offered by a change from a language centred on national security threats to one focused on the tragedy of deaths at sea and the evil of people smugglers that were soon being portrayed as wealthy, high-flying barons of human misery. Despite the shift in language, the broader political debate surrounding this issue has remained the same, and with both parties following the same internal logic in their attempts to out-do the other, the policies only become more extreme. Kevin Rudd’s recent announcement of the Papua New Guinea ‘solution’ has continued this trend. Rudd has promised that no asylum seeker who arrives by boat will ever be settled in Australia, a promise already being ridiculed by the opposition for its capacity to be delivered rather than for the moral weakness and brutality it represents. Opposition immigration spokesperson Scott Morrison suggested on Wednesday the Labor Party ‘just don’t believe in this stuff’. In one fell swoop, the debate has changed to a question of which party can be trusted to ensure not a single person seeking asylum by boat ever sets foot on Australian soil. The language used by both parties is purposefully designed to reinforce their policy positions, but it has also trapped them by establishing a political agenda that prohibits anything but a trend toward ever-crueller policies. Even when the focus shifts to preventing the tragedy of drowning, both parties are explicit in their desire to use cruelty as a deterrent. The discourse they themselves have helped establish does not allow them to take any other approach. What language have you heard surrounding refugees? What other effects does the language around refugees have on our opinions? Let us know in the comments below! This entry was posted in Opinion, Politics and tagged language, Opinion, politics, refugees. Bookmark the permalink.